More PAX East coverage - there are always tons of things to see and do at a PAX show and the highlight of this days coverage was an ultraviolent game called Ruiner. It is out later this month and I can't wait to try it again! 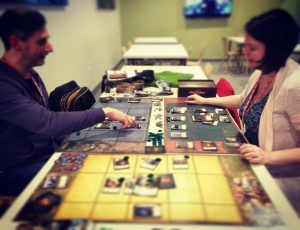 One of the best things about PAX is the fact that tabletop experiences are as prominent as the videogames; this year at PAX East I had a chance to try out a Tactical Card Game called Final War. This is from a passionate group in Australia called Games Lab and it is a complex experience that blends Magic the Gathering with Dungeons and Dragons to deliver a tabletop experience that was incredibly deep but also very fun to play. Final War is a dense game, with a large game board reserved for each player’s forces; the game can be enjoyed by 2-3 people in the current iteration; an expansion later in the year will enable a fourth player. In the game currently there are three Warlords to choose from, Elf, Guildmaster, and Werewolf, who have their own powers and player decks that contains forces, powers, and items. There is also a Fate deck that controls the flow of the game, in a quicker game 12 cards would be in the Fate deck, 25 for a Quest style game and the full 50 cards for a large scale experience. Over the course of the game each player will grow their forces and draw each round from the Fate Deck until the Final War card is revealed, once it is shown all players will battle each other until only one is left standing. Sometimes when you least expect it a game comes along that hits all of your buttons – anime inspired visuals, hard garage electronica soundtrack, gameplay that evokes the classic Crusader titles, and action that is as non-stop as it is addictive. That game was a title at PAX East called Ruiner from developer Reikon Games, a hard cyberpunk action title that had my blood pumping from the moment the demo started. Ruiner is a game centered around a killer that is manipulated by a control helmet; he is hacked by a secretive fugitive and sent on a mission to rescue a kidnapped brother and dismantle the HEAVEN corporation that used to control him. 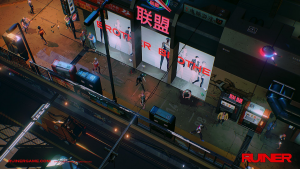 Much like the Crusader series from the 90’s, Ruiner is an isometric action game where you play a supremely capable killing machine as he battles his way through the futuristic city of Rengkok. Ruiner is very action heavy but there are exploration and narrative segments as you travel through the city looking for leads and missions. The city evokes the greatest aspects of Blade Runner futuristic landscapes and brought to mind environments famed Cyberpunk author William Gibson described in his novels. The art style is truly striking and the neon soaked environments coupled with overlayed cues and graphics drew me into the game instantly. 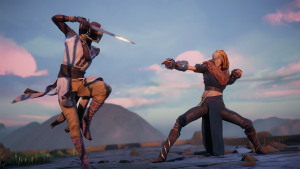 I had a chance to visit the Devolver Digital booth at PAX East and check out SloClap’s unique online co-op battler Absolver, a real-time martial arts action game that has incredible flexibility in its play styles and fluid action. The game has both a striking art style and innovative combat mechanics unlike anything I have yet seen in another video game. It is a tricky game to get the hang of, but once you do the depth of gameplay and interesting mechanics will keep you playing for hours. The game casts you as a member of the titular group of fighters called Absolvers, in your case you are just starting the process of becoming one of these elite corps of warriors in the fallen ruins of the Adal Empire. You awaken with a mask on given to you by the Guides, the rulers of these lands, it frees you from hunger, thirst and even death as you strive to learn all you can to join the ranks of the Absolvers. Your quest will take you across the land battling new enemies, helping people you come across and learning more and more fighting styles as you progress towards your goal. The game is an online co-op experience so you will encounter and fight other players as well as NPC enemies on your way to achieving your goals. Quake Champions is a simple game at its heart, take the classic Quake 3 Arena gameplay focusing on quick weapon, armor and health pickups as well as fast placed gameplay leveraging rocket jumps and twisty corridors and add some unique powers depending on the character you choose. I am probably dating myself but back in the early 2000s I played a lot of Quake 3 Arena, I mean a metric ton of it. I played so much I managed to convince my work at the time to invest in a few copies for the PCs in our lounge so we could play the game on our breaks. The game had some sort of secret sauce injected into its DNA that compelled you to play over and over again in a time where there were no loot boxes, item drops or customizations. 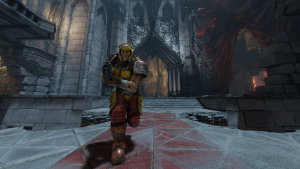 Now in 2017, Id Software is trying to recapture the magic with Quake Champions, a game built on the speed and mayhem of the original classics but injected with some of the custom hero mechanics from games like Overwatch and Team Fortress 2. The result is a game that felt as fluid and manic as the classic title, but with a nice layer of additional strategy thanks to the Champions featured in the game.